Road Warriors are remote users who need secure access to the companies infrastructure. IPsec Mobile Clients offer a solution that is easy to setup with macOS (native) and is know to work with iOS as well as many Android devices. For more flexibility use SSL VPNs, OPNsense utilizes OpenVPN for this purpose. To allow IPsec Tunnel Connections, the following should be allowed on WAN. To allow traffic passing to your LAN subnet you need to add a rule to the IPsec interface. You can select other options, but we will leave them all unchecked for this example. Save your settings and select Create Phase1 when it appears. Then enter the Mobile Client Phase 1 setting. If you already had IPsec enabled and added Road Warrior setup, it’s important to restart the whole service via services widget in the upper right corner of IPSec pages or via System ‣ Diagnostics ‣ Services ‣ Strongswan since applying configuration only reloads it, but a restart also loads the required modules of strongswan. For this example we will create a new user who may access the mobile IPsec vpn. Go to System ‣ Access ‣ Users and press the + sign in the lower right corner to add a new user. Save this user and reopen in edit mode to add privileges. 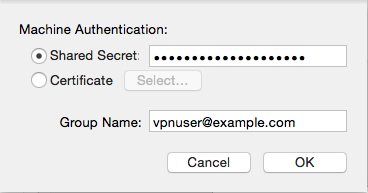 Add privilege User - VPN - IPsec xauth Dialin by pressing the + under Effective Privileges. To illustrate the client setup we will look at the configuration under macOS, including some screenshots. The configurations for Android and iOS will be settings only. Configuration samples listed here where created using latest macOS, iOS and Android devices on time of publication in February 2016. Start with opening your network settings (System Preferences ‣ Network) and Add a new network by pressing the + in the lower left corner. 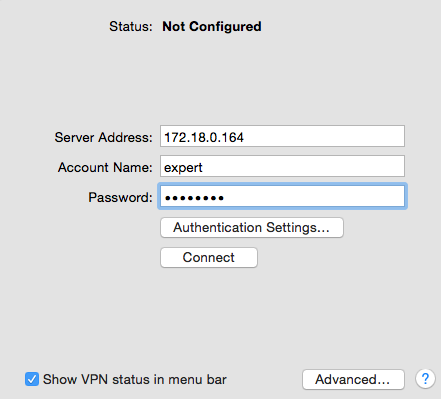 Now select VPN and Cisco IPSec, give your connection a name and press Create. Next press Authentication Settings to add the group name and pre-shared key. Press OK to save these settings and then Apply to apply them. Now test the connection by selecting it from the list and hit Connect. To add a VPN connection on an Android device go to Settings ‣ Connections ‣ more networks, select VPN. Press the + in the top right corner to add a new VPN connection. Save and try connecting. To connect enter Username and Password for the user expert we created in this example.